Get a Florida Licensed Home Inspector for Your Cape Coral Area Home Inspection. 15 years of Florida residential home construction experience. Home inspector in Cape Coral, Fort Myers, Naples, Bonita Springs, Sanibel, Lehigh Acres and surrounding areas. When looking for a home inspector in Southwest Florida it is important to select a FL Licensed home inspector that is insured and bonded. In addition, be sure that your inspector has the experience and knowledge about residential construction to ensure that you’re getting a high-quality inspection. At Tru-Check Home Inspections we invite you to join us for your home inspection. You will experience our quality and thorough service firsthand. And if you cannot join us for your inspection, you can be confident that we will provide you with top quality service and a comprehensive report including pictures and our free thermal imaging service. At Tru-Check Home Inspection, we believe in the long-term value of each customer and are proud of our reputation. Call 239-677-1342 or contact us today. Luis Lara is the owner of Tru-Check Home Inspections and your licensed home inspector. 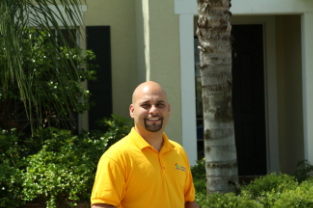 Luis enjoys helping you make the best decision by providing you with a comprehensive home inspection. He is also happy to help suggest ways to make your home a safer place to live in for you and your family. Luis has lived in the southwest Florida for over 30 years. Since 1992, he has been involved in the construction industry including working as a carpenter, installing roof systems, floor systems and load bearing walls. This industry experience includes a thorough understanding of the structural aspects of Florida homes. Luis' industry knowledge adds value to your home inspection. In February of 2001, he received his Residential Building License from the State of Florida. He has also built numerous single-family homes in the Lee County area. In October of 2006, he received his Roofing Contractor’s License from the State of Florida. As a roofing contractor and owner of a roofing business he replaced roofs on existing homes. In July 1, 2010, the State of Florida began requiring home inspectors to be licensed by the state. Tru-Check Home Inspections has a valid State of Florida Home Inspectors License # HI5265. Choose Tru-Check Home Inspections as your Cape Coral - Ft. Myers area Home Inspector and see how his 15 years of construction experience adds value to your home inspection. With Tru-Check Home Inspections, you can be confident that you are getting the best home inspection by a licensed home inspector with a lot of experience in the industry. Contact Tru-Check Home Inspections today. Home Inspector Servicing: Cape Coral, Fort Myers, Lehigh Acres, Bonita Springs, Naples, Sanibel and Captiva, Florida. Services from Tru-Check Home Inspections: Home Inspection, Wind Mitigation, 4 Point Insurance Inspection, Roof Inspection and FREE Infrared Thermal Imaging with every home inspection.